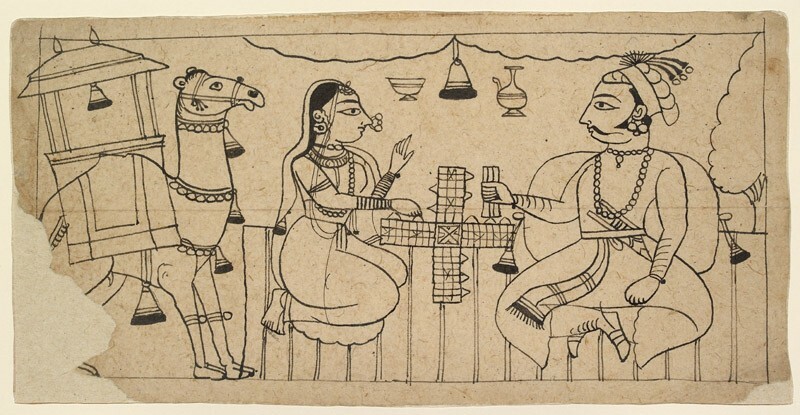 Seated on a striped durree rug beneath a canopy, a nobleman and lady play a game of chaupar while resting from their journey. 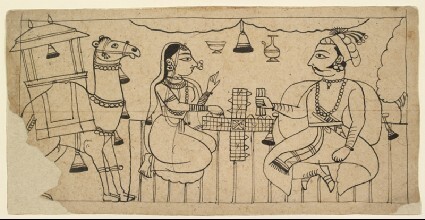 The riding-camel nearby suggests that this couple may be the legendary Rajasthani lovers Dhola and Maru, who eloped on a camel. 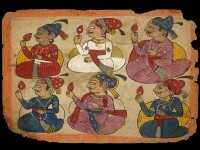 Chaupar or pachisi (the ancestor of modern Ludo) is a race game played with dice on a cruciform board, usually made of cloth. Here the lady moves one of her pieces, while the nobleman holds the three stick dice whose roll will determine the next move.